At Venice Ceiling Contractor we have one goal in mind, improving the value of your Venice home and your quality of life. Our Venice Ceiling Contractor consists of skilled teams of ceiling professionals, knowledgable in every facet of interior and exterior construction. At Venice Ceiling Contractor we work with you one-on-one to create solutions that exceed your expectations, in beauty and functionality. Although popcorn ceilings were a very popular design trend during the 1960s and 70s, it has definitely lost its appeal these days. Popcorn ceilings catch dirt and dust, and can even contain asbestos. It can be very time consuming and messy to remove, which is why many people turn to professional popcorn ceiling removal experts to remove it. Venice Ceiling Contractor offers simple hand-texturing of walls and ceilings, and for ceilings we also offer a flat finish, as well as the popular textures like knock down and orange-peel textures. See samples of textures offered. Our trusted Venice ceiling professionals do the dirty work for you in a timely, efficient manner. Contact us today for a free estimate! 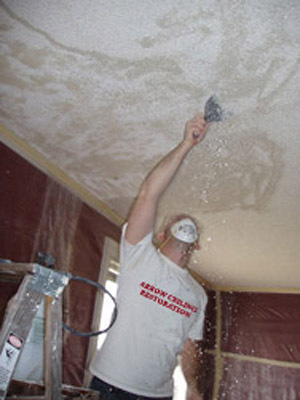 If you're looking for a Venice Florida Ceiling Contractor Specializing in Popcorn Ceiling Removal, and Texture Ceilings and Walls, contact Arrow Ceiling Restoration today at (941) 870-8078 or complete our estimate request form.